Every once in a while, I post a list of posts (mine or other ones that I think are fun). That way, you can click the ones that look interesting, then click links on those posts…until you are completely immersed in pet information and lost on the internet…you know, Bunny Trails. Fun! Today’s Bunny Trail is a list of posts on the veterinary website dvm360. And speaking of bunnies, my Saturday’s Pet Blogger Hop post this week will be about rescue bunnies and whether it is a good idea to surprise kids with REAL bunnies on Easter and will be linked to a NEW blog hop on the All Things Dog Blog. Thank you for the kind invite Carrie! 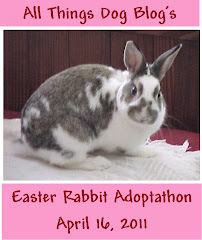 Click this super cute picture to learn more about All Things Dog Blog’s Easter Rabbit Adoptathon! Along the bunny theme, here is a picture of one of my very favorite and cutest patients, Sophie Voss. She is an English Angora Rabbit. Her color pattern is called “broken.” Isn’t she gorgeous? And so soft! She was the first bunny I ever spayed. Thank you so much Stephanie for trusting me with that “first!” What a trusting friend, huh?? I called my veterinary school classmate, Anne Belshan, DVM and Micah Kohles, DVM, Oxbow’s veterinarian and a small animal practitioner in Lincoln Nebraska, (who had both done more rabbit spays than zero) for words of wisdom, and they were both SO helpful and encouraging. Sophie did wonderfully and everything went without a hitch! As ovariohysterectomies go, rabbits are actually easier than dogs, cats, rats, hamsters and mice! And finally, along the Easter theme…Remember! You can have cats or Easter lilies, but not both! Lilies are very toxic to cats’ kidneys. May you have a wonderful and blessed Easter season. Send me pictures of your own gorgeous bunnies (and other pets!) and I will post them too! This entry was posted on Thursday, April 14th, 2011 at 2:09 pm and is filed under Exotic Pets, Thoughts, What I am Doing This Week. You can follow any responses to this entry through the RSS 2.0 feed. You can leave a response, or trackback from your own site.